When something breaks down in your home the first inclination is to check the warranty. Obviously, if it is still covered then absolutely bring in a repair person. What you have to be careful about is exactly what you’re warranty covers. You might also want to do a little investigating online and find out if a repair is something you could do on your own. That is a good option when the warranty has run out. 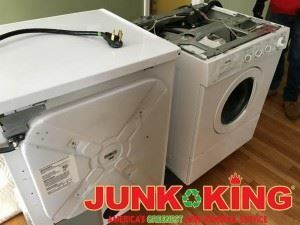 Although fixing an appliance is a good temporary solution chances are that same device will eventually break down again. When something breaks down and isn’t immediately repaired there is an inclination to put it in storage in the hopes that someday it will get fixed. That usually works for smaller things like vacuum cleaners or blenders. However, it’s not uncommon for bigger items like a washer or stove to be tucked in the garage waiting repairs. Of course, it means replacing that item. Once that happens, forget about the broken thing because it’s no longer a priority. That means it’s just taking up valuable storage space and will probably never be used again. That doesn’t seem very practical. The smart move is to get rid of something that can no longer be fixed. Not only would that hold true to things like kitchen appliances but also bigger items like a backyard tool shed. When something like that has become to beat down by the weather, then it’s time to dismantle it and have it hauled away. One call to Junk King Chicago West takes care of that. Junk King has been hauling away all kinds of unwanted rubbish for over 10 years. They’ve perfected how to accomplish this task with very little effort on your part. All you need to do is show the Junk King crew what you want taken away and it is as good as gone. If you need to toss out junk, then Junk King Chicago West is the only call to make. This entry was posted in Carol Stream Junk Removal and tagged fix, junk, toss on August 27, 2017 by Junk King. Last updated August 27, 2017 .